Lubricant is the LIFE BLOOD of any paintball marker. TechT Gun Drops Oil is formulated to provide maximum friction fighting protection and decreases the friction of moving parts. Gun Drops throughly coat parts and stays where you put it for a really long time. Gun Drops will not eat away at your o-rings like most oils. Gun drops is safe to use on any type of pneumatic seal in any application, even metal on metal. Gun Drops is non-flammable and used anywhere lubricant is needed. Gun drops are a great cold weather substitute for grease. Designed to be "Super Slick" like our TechT Gun Sav Grease, Gun Drops Oil was specifically formulated for guns that call for a liquid lubricant i.e. Tippmanns, Spyders, Egos, G6R, Azodin, of any gun that is similar. It can even be used on Real Firearms and Airsoft Guns. 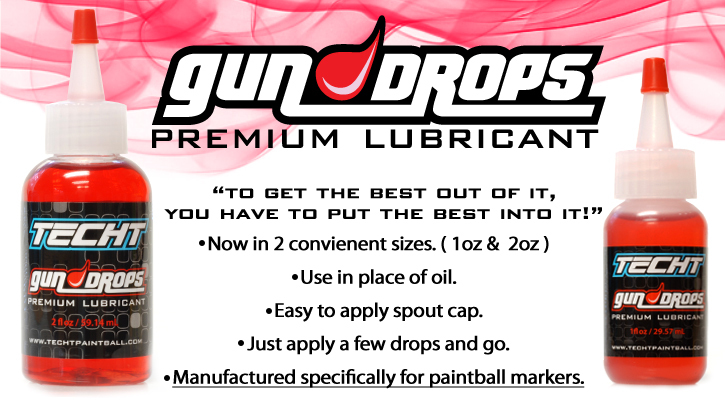 Gun drops is also great for "spool valve" type paintball guns. It can be used in place of grease in any paintball application. Our Dropper Tip applicator assures precision placement of Gun Drops and avoids any messy spills. Gun Drops surpasses all expectations of gun oil! Now available in 1oz and 2oz size bottles. Our thick, rich formula adheres to any part it comes in contact with to assure your marker stays protected. Gun Drops Oil is designed to stick to the part you need to lube, while minimizing the amount of drag. This means Gun Drops stays in your marker and is not blown out of your barrel. Designed for all internal marker parts that require oil, including hammers and rammers. Great for Tippmann hammers and Ego rammers. Great for routine maintenance of your marker- just a couple drops keeps your marker lubed & shooting! Easy application with the included dropper makes lubing those hard to reach areas within a marker easier. TechT Gun Drops take paintball oil to a whole new level. Our oil is thicker and stays where you put it. Use less and apply it less often is our way of thinking.